Martin Blank, Ph.D of Columbia University representing 190 international scientists in an Appeal to the UN, UN Member States and the WHO on the risks of electromagnetic fields emitted by telecommunications and utility technologies. Cautioning strongly, Dr. Blank says, “The time to deal with the harmful biological and health effects is long overdue. To protect our children, ourselves and our ecosystem, we must reduce exposure by establishing more protective guidelines.” Video produced by ElectromagneticHealth.org on behalf of international scientists and the Appeal Committee. We represent citizens who want our government to set exposure standards for electromagnetic radiation that are biologically based, instead of being based on long since invalidated thermal standards. We represent the growing percentage of the population that has become electrically sensitive—people who are finding it increasingly difficult to cope in wireless environments. The benefits of modern life, including the ability to participate in society, and hold jobs in traditional office buildings, are increasingly not available to an estimated 3-8% of Americans today. And, we represent the people who want rights of state and local governments to establish healthy environments in their communities returned—rights that were taken away in the Telecommunications Act of 1996, which tied the hands of local governments, preventing them from resisting towers and antennas in their communities on health or environmental grounds—even when harm became clear. This power grab by the federal government, which facilitated the build out of the antenna infrastructure across America by the wireless telecommunications industry beginning in 1996 has been a travesty for human, animal and planetary health—and it must be brought to light and reversed. There was utter disregard by our Congress of decades of science on the biological effects of microwave radiation on human regulation systems, cells and DNA and the errors in judgment by our government must be corrected immediately to reestablish the trust of American people in our government and to stem the damage to health occurring. Illness linked to electromagnetic radiation exposure include many cancers, neurological conditions, ADD, sleep disorders, depression, autism, cognitive problems, cardiovascular irregularities, hormone disruption, immune system disorders, metabolism changes, stress, fertility impairment, increased blood brain barrier permeability, mineral disruption, DNA damage and much, much more. 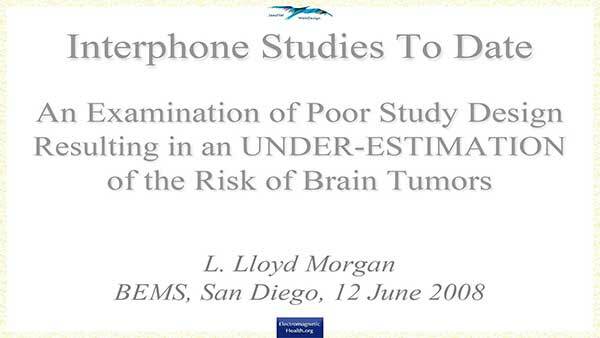 The Interphone Study is a 13-country investigation examining if cell phone use causes tumors. It is substantially funded by the cell phone industry: €3.2 million ($5.1M) in Europe, $1 million in Canada and unknown amounts in Japan, Australia and New Zealand.